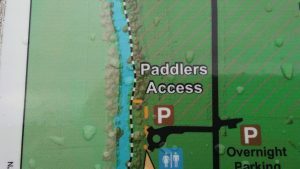 Rarely used in winter, the Luckiamute River paddlers’ access parking area last week. 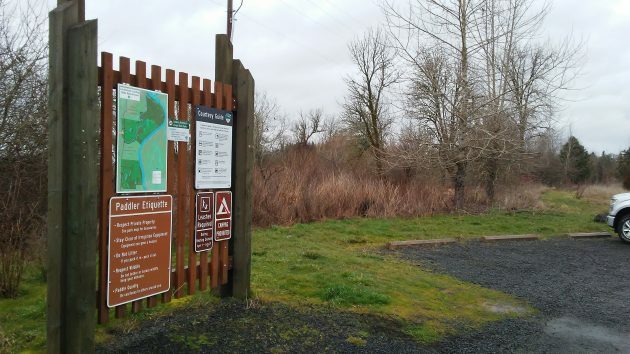 For more than five years, Oregon state park officials have wrestled with plans to install a floating dock and ramp on the Luckiamute River, so that launching and retrieving canoes and kayaks would be less of a chore. Now they’ve given up and changed the plans to something less complicated and easier to achieve. I’ve been following the story since at least 2012, when a state parks official hoped the float and ramp would be completed that fall. It didn’t happen. Nor did it happen in the years that followed. Permit delays, changes in personnel, design complications — those generally were among the reasons the float and ramp remained an unrealized hope. Sounds promising. How about the timing? I went to take a look myself, sloshing about 150 feet beyond the steep chute that is the present launch site unsuitable for most users. 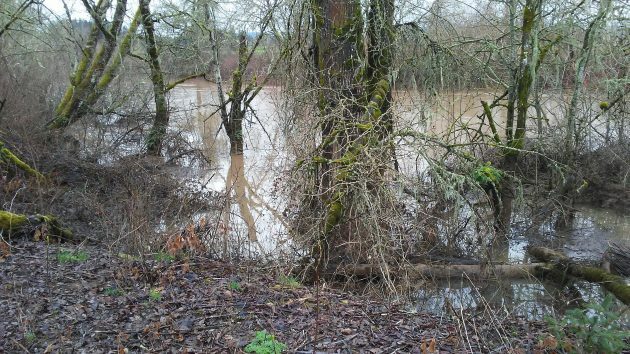 The river was running high, so it was impossible to see the bank the way it would be in summer. But I think I found Strandberg’s cove. It looks as though, when the water level is lower, it will indeed be an easier place to launch. This looked to me like the cove now planned as the new access point. Good to hear things are happening finally. A “advanced takeout” as they called it for awhile was a huge understatement!